The FL-O Series of industrial flowmeters is designed expressly for flowrate monitoring of petroleum-based oils and coolant fluids. These simple, rugged meters are designed for industrial use with all 300 Series SS and PTFE wetted parts and an aluminum housing. There are no fragile glass tubes, and the flowrate can easily be read even with opaque fluids. The built-in signal switch can be used as an alarm to report high or low fluid rates. 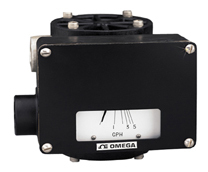 FL-O flow monitors are also capable of withstanding the extremes of industrial use, with 200 psig and -18 to 93°C (0 to 200°F) environmental ratings.